With HTTPS security being a priority for Google, knowing that your SSL certificate is installed and working properly is essential. If it’s not, Chrome will warn your visitors about your website’s lack of security – and potential customers may turn to your competitors instead. There are all kinds of errors that browsers can encounter when dealing with SSL certificates. To make sure you’re in good standing with both Google and your website visitors, you can check your SSL certificate using an SSL checker tool. It’ll let you know if there are any problems with your certificate and give you a clue as to how to fix them, too. Using an SSL checker regularly can reduce your risk of losing business. You wouldn’t leave your front door unlocked when you go out, so why would you risk leaving your website unsecured? This is the main basis for SSL (Secure Sockets Layer) certificates – digital certificates that serve to protect you and your customers. The https:// at the start of your web address along with the padlock icon in the address bar reassure your customers in two main ways. Firstly, SSL authenticates the identity of your website, signaling to customers that the address they’ve landed at isn’t a fake website created by a scammer. Secondly, the SSL certificate is a promise that their data is encrypted and in safe hands. It’s not just about reassuring your visitors, however. Google now prioritizes secure websites in its search engine rankings, so not having a valid SSL certificate can harm your position in the rankings, too. How Could an SSL Checker Help Me? To explain the benefits of an SSL checker, we first need to go over how SSL certificates work. These are essentially the digital version of a lock and a key. SSL certificates work using Certificate Signing Requests (CSR) that live on your server. Both public and private keys are generated with the CSR. It’s the public key that locks (encrypts) sensitive data, and the private key that unlocks (decrypts) it after it’s been safely transmitted to your server. Problems with the installation or functioning of your SSL certificate mean that the data is not secure, which is a big problem if visitors are filling out any forms on your website or purchasing a product from you. 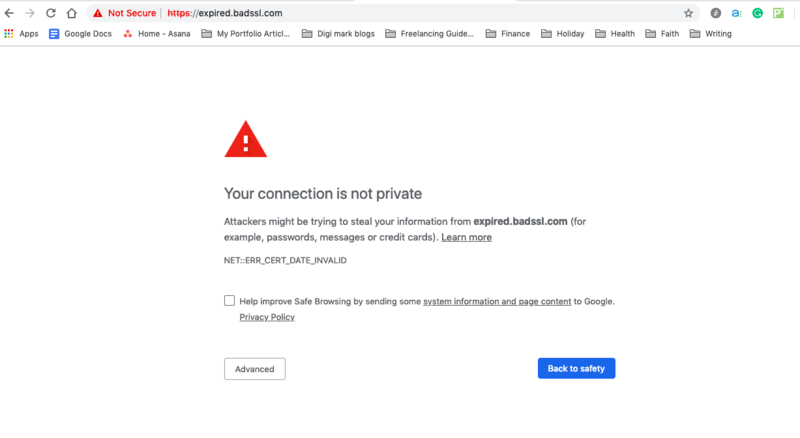 Since mid-2018, the Google Chrome browser has been displaying a “Not Secure” banner in the address bar for any website not using HTTPS. As Chrome is a popular browser choice, it’s more important than ever to have a valid SSL certificate for your website – even if you don’t handle payment transactions or collect personal data. Rather than risking the loss of a customer because of a browser warning, you should be regularly checking on your SSL certificate with an SSL checker tool. SSL certificate errors can harm your business — both in terms of your sales and your reputation. An SSL checker tool is a quick and easy way to make sure your SSL certificate is installed correctly – and that it’s still valid. Some SSL checkers will also look for security gaps or errors that have to be resolved on the web server. If you’re planning on growing your website or online business, you should definitely schedule regular checks with an SSL checker certificate tool. Also, be sure to use the SSL checker tool if you’ve made any changes to your server configurations, as this can cause compatibility issues with your SSL certificate. As with any sort of technology, SSL errors can occur at any time. Since these errors are technical in nature, it’s not always clear what they mean – or why they’ve occurred. Knowing in advance the kinds of SSL errors you may encounter can make it easier to deal with them. Here’s a rundown of the most common SSL errors. SSL certificates authenticate a website’s identity, so the domain of the SSL certificate needs to match the domain in the URL. If there’s any kind of discrepancy between the two, you’ll see this error. Essentially, your browser thinks that the SSL certificate belongs to a different website address. You might see the Certificate Name Mismatch error if the certificate was issued to “exampledomain.com,” but you’ve typed “www.exampledomain.com” into your browser. Luckily, this is a simple error to resolve or prevent: when you buy an SSL certificate, check that it supports both exampledomain.com and www.exampledomain.com. You’ll want to get certificates issued by a root authority, as these are more trustworthy. SSL certificates not signed by a root authority tend to produce errors in your browser. Security-conscious Certificate Authorities add layers of protection to their SSL certificates by not signing the certificates at the root. Instead, they’ll create a chain of trust using “intermediate certificates.” Your browser can usually detect this chain of trust, so if you see this error even with a certificate from a root authority, it’s possible that there’s a problem with the intermediate certificate. Problems with intermediate certificates tend to occur when an SSL certificate isn’t installed correctly. This is more likely to happen if you’re installing your SSL certificate yourself — or if your web administrator doesn’t fully understand how intermediate SSL certificates work. When an SSL certificate with a chain of trust is properly installed, your browser will be able to trace the chain of trust back to the root authority. But if the SSL configuration doesn’t display the chain of trust, your browser will display the Intermediate SSL Certificate Missing error. SSL relies on a combination of Certificate Signing Requests (CSR), private keys, and public keys. For it to operate properly, both the private key and the CSR have to be on the same server. You’ll see the Private Key Missing error when the private key is lost (or deleted) from the server. In this case, you’ll have to either recover your private key or generate a new CSR. You may run into errors with your SSL certificate if you don’t have all your website files hosted on a secure source. It’s also common to encounter the Mixed Content error during the initial installation of your SSL certificate, especially if you’ve got a WordPress website. Essentially, if your website has an SSL certificate but delivers some content over HTTP (rather than HTTPS), it could potentially be read by hackers. There are two types of mixed content: mixed active content and mixed passive content. Of the two, mixed active content is more problematic, and browsers tend to block this completely. Mixed active content happens when an HTTPS website loads a script file using HTTP. This makes the whole page unsecured and it’s the reason browsers block it. Mixed passive content is less troublesome. Images loaded over HTTP don’t compromise page security, so browsers will usually just display a warning in the address bar. To find the source of your Mixed Content error, open the source code of any page and use the search function (Ctrl+F) to look for “src=http.” Scan through all these instances to see if any content is being pulled from an unsecured HTTP connection. It’s possible to create and sign your own certificates; in fact, web developers often use these on their development servers. Self-signed certificates are not recognized by browsers, though. If the browser detects a self-signed certificate, it will automatically identify the website as not secure. Some web developers will offer free SSL certificates with design packages. In some cases, these are genuine SSL certificates from trusted CAs. In many cases, however, these are actually self-signed certificates. If you don’t use an SSL checker tool to verify this, it may hurt your brand’s credibility. How Do I Fix SSL Errors? For full transparency, I’ll be honest and say that fixing SSL errors isn’t always easy. Some are more complex than others. Resolving all SSL errors does require a certain amount of technical knowledge — and sometimes, they require a lot of technical knowledge. If you’re good with handling all the technical stuff, then you can tackle these SSL errors on your own. You can find detailed technical guides to resolving common errors on the internet: some even include the specific code and commands you’ll need to implement, from trusted SSL certificate providers such as Comodo and Symantec. If not, then it’s best to let a web developer, your hosting company, or some other technical genius handle it. If you don’t know what you’re doing, trying to fix it yourself could cause more problems than you’ve already got. That being said, if you’ve got a WordPress website, there’s one SSL error you can fix without much technical knowledge. If your website has a Mixed Content error, there’s a WordPress plugin that can help you resolve it. 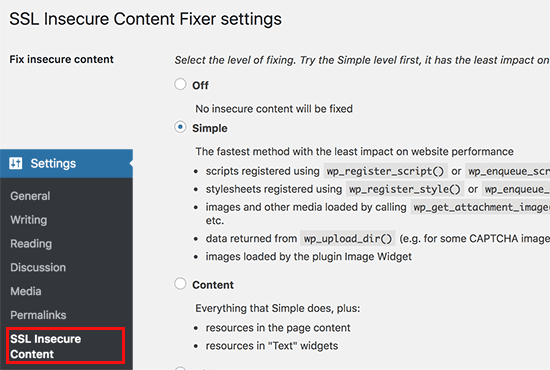 The SSL Insecure Content Fixer plugin makes it possible to find the source of the Mixed Content error and resolve it. There are five different levels of fixes and the developers recommend you start with the first one: “Simple.” This fixes any problems with your scripts, stylesheets, and media library content. Using this plugin may require some trial and error. If the Simple level doesn’t fix everything, you can also try the “Content,” “Widgets,” “Capture,” and “Capture All” levels. But be aware that the more advanced levels may temporarily affect the performance of your website. A few years ago, you only needed an SSL certificate if you were selling things online. Now, due to changes in privacy laws in Europe (GDPR) and Google’s security-focused search engine ranking algorithms, having an SSL certificate is becoming a necessity. Ensuring that SSL certificate errors aren’t losing you customers is now an essential maintenance task. SSL checker tools make this much less complicated than performing manual checks – and mean that you can run checks regularly without taking up huge chunks of time. As HTTPS becomes the new web-address ‘norm’, your visitors will become more aware of websites that Chrome labels as ‘not secure’. Spending a few minutes a week using an SSL checker is well worth the effort when you think about the potential business that could be lost if your customers don’t trust your website to encrypt their data.